This page is about Rev. Elisha Gillette and his immediate family. Elisha was born in Milford, Connecticut on August 17, 1733, one of at least eight other children. His parents were William Gillette and Elizabeth Welch, who were married there in 1722. There are numerous accounts that say Elisha's father was a Christian minister, and it seems likely that he was closely associating with Christians that believed in worshipping on Saturday, believing it to be "the seventh day" mentioned in the Bible as the "sabbath." One written history of the Seventh Day Baptist denomination refers to William as being a Seventh Day Baptist minister himself, but another account suggests that while he was a believer in the "Saturday sabbath," he was not a member of the Seventh Day Baptist denomination, but was of the "sabbatarian" view before meeting people of their group. In fact one account credits William Gillette with being the one who converted to the "sabbath" view a man named Abel Noble, who went on to become one of the primary founders of the SDB denomination. In any case, it does seem evident that Elisha's father William was a "sabbath-keeping" minister who eventually associated closely with SDB people. In light of the fact that the Elisha we have here under discussion went on to be ordained in the Seventh Day Baptist denomination, becoming "Rev." Elisha Gillette and worked as a clergyman for the advancement of that church, we cannot help but imagine his father having been an inspiration to him in his life choices, growing up. At Milford on April 13, 1753 Elisha married a certain "Miss Buckingham" whom he had known all his life. Both were born in Milford in 1733. We are still researching whether she was Lucy or Sarah. Some records name her Sarah and others Lucy. There are some that say she was Sarah Buckingham, the daughter of John Buckingham & Keziah Clark, and some that say she was Sarah Buckingham the daughter of Nathaniel Buckingham and Sarah Smith. And of course "Lucy" Buckingham is a whole different problem. Elisha's ministry was under the auspices of the Seventh Day Baptist church at Piscataway, New Jersey. He was still serving that church when he and his young bride moved to Suffolk County on Long Island. His work was centered in Suffolk county in Huntington, Patchogue, Southold and Orient (formerly known as Oysterponds). Elisha planted and pastored the first Seventh Day Baptist church on Long Island, at Oyster Ponds. The church at Piscataway was the "mother church" to Elisha's church on Long Island. Elisha was a member of the Piscataway church. In 1769 he went to Piscataway from his hometown of Milford, CT., and was ordained at Piscataway in 1786. He went on from Piscataway to found the church at Long Island, but remained a member of the Piscataway church even after the Long Island church was established, and regularly spent time at the mother church at Piscataway. It is possible that his father William had some relationship to Elisha's religious work. One source says that in 1760 William was "living in Huntington, N.Y., where his son Elisha was a minister." (Huntington is in Suffolk County on Long Island.) It is probable that William was taking an active interest in his son's religious work, or just spending time with kin there, and not being "cared for in his latter years," because the same source that has him in Suffolk County in 1760 has him in New Milford in 1780. NEW Milford, up in Lichfield County, CT, is not to be confused with Milford down in New Haven County, CT. One of Elisha's brothers, Abel Gillette, lived in New Milford, and was a "warden of St. John's Episcopal Church" there, and Abel's sister Elizabeth was in New Milford as well, married to Giles Oviatt. It would appear that William travelled about and spent time where his children and grandchildren were. Elisha's first wife, Sarah (or Lucy), bore him children, the first, named Elisha, in 1754, followed by Elisabeth, Paul, Sarah, Fidelio, and Lucinda. Apparently Sarah (or Lucy) passed away sometime between 1760 - 1779. Elisha married his second wife, Hannah Platt, sometime before 1781. Others and myself previously thought that this Hannah Platt was a widow, and that Platt might have been the name of her deceased husband. And so, there are references in circulation, to Elisha marrying the "widow Hannah Platt." I now believe this to be an error. In looking at as many references to them as I can, I believe that the mistake got going by an early researcher attributing an abbreviation for widower, ("w" or "wid" or "widow.") wrongly to Hannah, when it meant Elisha. For instance, one record quite plainly reads, "Elisha Jiliitt Widower m. Hannah Platt, 10 Sept 1777 at Huntington First Church." But one more difficult to decipher, simply lists the union as "Gillett, Elisha wid. Hannah Platt," and I believe that is how the incorrect reference to a "widow Hannah Platt" got into use. So, I expect to find confirmation that Platt was Hannah's maiden name. It is not certain if Elisha's 7th child, Zebulon, was from his first wife or his second. But he died at age 11. Another child, born later, will also be named Zebulon. 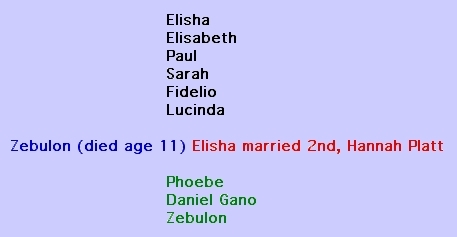 The following list shows Elisha's children from the first marriage, followed by those from the second. Phoebe, Daniel and the last son, Zebulon, were all definitely from Hannah. 2. Elizabeth, b. 1754 (by Sarah/Lucy) died 16 Sept 1760 in her fifth year. Buried in St. John's Old Churchyard Cemetery. Record says, "GILLET Elizabeth, dau of Mr. Elisha & Mrs. Sarah, d 16 Sept 1760 in 5th yr."
4. Sarah b 1759 at Milford, married on Sept 11, 1783 to Sgt John Stowe at Milford, CT. Sarah died at Milford Jan 2, 1838. 5. Fidelio Buckingham Gillette b. July 28, 1761, m Tabitha Dunham, moved to Cambridge, Washington County, NY. Another source "out there" gave Fidelio's birth as 1757. 8. Phoebe, by Hannah Platt, Phoebe b Jan 22, 1781, m Daniel Saxton of Patchogue, Long Island. 9. Daniel Gano Gillette, by Hannah. Some say he was Gano Gillette. But this is probably the Daniel Gano Gillette who became a Suffolk County Judge. 10. Zebulon (the second of the children so named), by Hannah Platt, Zebulon was b. Nov 4, 1788 at Huntington, L.I. Zebulon married Lucinda Avery of Blue Point, L.I. on Jan 25, 1807 at Blue Point. Zebulon died Feb 13, 1879 at Patchogue, Suffolk County, on L.I., NY. Zebulon & Lucinda had the following five children: 1. Gelston Gillette (married 1st Randall, 2nd Terry), 2. Edgar Gillette (married 1st Mills, 2nd Wicks), 3. Lucinda Gillette, 4. Lucilla Gillette (married Roe), 5. Mary Gillette (married Howell), 6. Charles Zebulon Gillette (married Edwards). Elisha & family were listed in the 1790 Census at Southold in Suffolk County on Long Island, and in the 1800 Census, in Brookhaven township in Suffolk County. Some sources state that Rev. Elisha Gillette died in May 1820 at Patchogue in Suffolk County at the age of 87. Some helpful search words and phrases and word arrangements that are associated with info provided in this website (as examining the site will show). Also, a robot plants ADS on the page that match the majority of words that it finds ON the page. It is nicer when the ads that get generated are not about irrelevent GARBAGE. So, in thoughtfulness to our visitors it is hoped that these words and phrases might also help influence those ads to be such as are compatible with our spheres of interest, Gillett genealogy, Gillettes in America, Gilletts in America, Gillette ancestors, Gillette ancestor, Gillett ancestors, Gillett ancestor, Rev. Guillaume Gillette, Rev. Guillaume Gillett, Rev. Guillaume Gylet, Rev. Guilliaume Gylett, Rev. Guillaume Gillet, Rev. Guillaume Gillitt, Rev. Guillaume Jillit, Rev. Guillaume Jillitt, Rev. William Gillett, Rev. William Gillette, Rev. William Gylet, Rev. William Gylett, Dr. Guillaume Gillette, Dr. Guillaume Gillett, Dr. Guillaume Gylet, Dr. Guilliaume Gylett, Dr. Guillaume Gillet, Guillaume Gillitt, Dr. Guillaume Jillit, Dr. Guillaume Jillitt, Dr. William Gillett, Dr. William Gillette, Dr. William Gylet, Dr. William Gylett, Guillaume Gillette, M.D., Guillaume Gillett, M.D., Guillaume Gylet, M.D., Guillaume Gylett, M.D., Guillaume Gillet, M.D., Guillaume Gillitt, M.D., Guillaume Jillit, M.D., Guillaume Jillitt, M.D., William Gillett, M.D., William Gillette, M.D., William Gylet, M.D., William Gylett M.D., Jeremiah Gillette, Jeremiah Gillett, Jeremiah Gylet, Guilliaume Gylett, Jeremiah Gillet, Jeremiah Gillitt, Jeremiah Jillit, Jeremiah Jillitt, Jeremiah Gillett, Jeremiah Gillette, Jeremiah Gylet, Jeremiah Gylett, Sarah Tryon, Sarah Tyron, John Tryon, John and Sarah Tryon, Rev. Elisha Gillette, Rev. Elisha Gillett, Rev. Elisha Gylet, Rev. Guillaume Gylett, Rev. Elisha Gillet, Rev. Elisha Gillitt, Rev. Elisha Jillit, Rev. Elisha Jillitt, Rev. Elisha Gillett, Rev. Elisha Gillette, Rev. Elisha Gylet, Rev. Elisha Gylett, Gillette genealogy, Gillett genealogy, Gillette ancestry, Gillett ancestry, the Gillette family, the Gillett family, Gillette family tree, Gillett family tree, Wethersfield, Simsbury, Gillette married, Gillett married, Elizabeth Welch, Elizabeth Welsh, Lucy Buckingham, Sarah Buckingham, widow Hannah Platt, widow Platt, Milford, CT, Milford, Connecticut, Milford, New Haven, CT, New Milford, Cambridge, NY, Cambridge, New York, Jackson, NY, Jackson, New York, Jackson Lakes, Washington County, NY, Washington County, New York, Huntington, LI, Huntington, Suffolk County, Huntington, NY, Huntington, New York, Oyster Ponds, Southold, Long Island, lookups, Brookhaven, Sayville, Patchogue, Blue Point, Bayport, sabbath keepers, sabbath-keepers, sabbatarians, Huntington, USGenWeb, Huntington Station, historical society, reunion, census, Long Island births, Long Island deaths, family tree, Oyster, Bay, Oysterponds, Oyster Ponds, Old Orient, Southold, Piscataway, NJ, Orient, Brookhaven, Patchogue, Long Island, sabbath, Seventh Day Baptist, SDB, Flora Clark, records, Flora Clark books, Donald Lines Jacobus, Donald L. Jacobus, Donald Jacobus, D. L. Jacobus, The Other Gilletts, The Other Gillettes, The American Genealogist, TAG, The New Haven Genealogical Magazine, Abram Dunn Gillette, Abram D. Gillette, Abram Dunn Gillett, Abram D. Gillett, Rev. Abram Dunn Gillette, Abram Dunn Gillette, D.D., Zebulon Gillette, Zebulon Gillett, Gelston Gillette, Gelston Gillett, Gilston Gillette, Gilston Gillett, Gilson Gillette, Gilson Gillett, Elizabeth Gillette, Elizabeth Gillett, Giles Oviatt, Phebe Terrill, Phoebe Terrill, Phebe Tyrrill, Phoebe Terrell, Phebe Tyrrell, Abel Gillette, Abel Gillett, John Gillette, John Gillett, Comfort Plumb, Benjamin Plumb, Elisabeth Camp, Zebulon Gillette, Zebulon Gillett, Mary Bryan, Ebenezer Bryan, relatives, kin, allied, roots, forum, genforum, rootsweb, FHC, Family History Center, Salt Lake City, Mormon, LDS, gedcom, Mary and John, Mary & John, passenger list, Recovery, the Recovery, Windsor, Chaffcombe, Somerset, Jaques, Jaques de Gylet, France, 1688, Huguenot genealogy, Huguenot ancestors, descendants of, vital, statistics, records, descended, 1722, history, Fidelio Buckingham, Gillette DNA, kin, kindred, kinship, family, reunions, families, relatives, family tree, heraldry, colonial, Reunion, Gellitt, Jillett, Suffolk County, Connecticut genealogy, New York genealogy, Milford genealogy, Wethersfield genealogy, Gillette forum, Jonathan Gillett, Jonathan Gillette, Jonathan and Nathan, Huguenot ancestors, descendants of, King, historical society, Milford births, Milford deaths, Milford lookups, Milford marriages, Milford Historical Society, Platt, Windsor, CT, Simsbury, CT, Gillettes of Milford, Gilletts of Milford, Nathan Gillett Pond, Nathan G. POND, Nathan Gillette Pond, Windsor, CT, Simsbury, CT, New Haven, colonial Connecticut ancestry, Jellett, descendants of, 1722, Buckingham ancestry, history of Milford, Milford genealogists, Milford roots, Milford ancestors, Milford ancestry, Milford history, history of Milford, genealogy in Milford, CT, history of New Haven, New Haven, CT, New Haven, Connecticut, New Haven births, New Haven deaths, family tree, New Haven lookups, New Haven marriages, New Haven Historical Society, New Haven lookups, New Haven genealogy, New Haven genealogists, New Haven roots, New Haven ancestors, New Haven ancestry, New Haven history, history of New Haven, genealogy in New Haven, CT, history of New Haven county, New Haven county, CT, New Haven county, Connecticut, New Haven county births, New Haven county deaths, family tree, New Haven county lookups, New Haven county marriages, New Haven county Historical Society, New Haven county lookups, New Haven county genealogy, New Haven county genealogists, New Haven county roots, New Haven county ancestors, New Haven county ancestry, New Haven county history, history of New Haven county, genealogy in New Haven county, CT, Family History Center, FHC, RootsWeb, Gillette genforum, Gillett genforum, Gillet genforum, library, census, Rev. Elisha Gillette, Elisha Gillett, France, 1688, Milford, 1722, Elizabeth Welch, Huguenot, Jeremiah Gillette, SDB, Seventh Day Baptist, Huguenot genealogy, Huguenot ancestors, 1722, Elizabeth Welch, Simsbury, Fidelio Buckingham, Long Island, sabbath, sabbatarian, sabbatarians, Rev. William Gillette, the other Gilletts, Gelston, Zebulon, Milford, CT, Connecticut, Donald Lines Jacobus, The Other Gilletts, the "Other" Gilletts, Jeremiah, Brookhaven, Sayville, Patchogue, Piscataway, NJ, Adventists, sabbath keepers, sabbath-keepers, sabbatarians, Seventh Day Baptists, Seventh Day Baptist Church, Seventh Day Adventists, Huntington Station, Piscataway, New Jersey, Rev, Rev., 1688, Sarah Buckingham, Milford births, Milford deaths, Milford lookups, Milford marriages, Milford Historical Society, Buckingham genealogy, Noble ancestry, Noble surname, Noble genealogy, Noble family tree, Dunham surname, Dunham genealogy, Dunham family, Dunham descendants, Dunham family tree, USGenWeb, reunion, genforum, forum, message board, gedcom, Huguenot genealogy, Huguenot ancestors, descendants of, vital, statistics, records, Gillette genealogy, genealogical society, Tryon ancestors, Tryon family, cyndislist.com, Cyndy's List, Cyndis List, Cindy's List, Brookhaven, NY, Brookhaven, Suffolk County, NY, colonial Connecticut ancestry, colonial Long Island, colonial New York, Jellett, history of Long Island, Long Island genealogists, Long Island roots, Long Island ancestors, Long Island ancestry, Long Island history, history of Long Island, genealogy in Suffolk County, history of Long Island, Suffolk County births, Suffolk County deaths, Suffolk County lookups, Suffolk County marriages, Suffolk County Historical Society, Suffolk County genealogy, Suffolk County genealogists, Suffolk County roots, Suffolk County ancestors, Suffolk County ancestry, genealogy in Suffolk County, Maloney family, Maloney genealogy, Maloney ancestors, Maloney roots, Weed family tree, Weed genealogy, Weed ancestor, Weed ancestors, Weed ancestry, Weed roots, Rev. Samuel H. Weed, Rev. Samuel Henry Weed, Colona, Thomas Weed, 1549, Northampton, England, Stanwick, Jonas Weed, 1575, John Weed, Samuel Weed, Reuben Weed, Nathaniel Weed, Andrew Weed, James Weed, Walter Graham, William Graham, Graham family, Graham genealogy, Graham ancestors, Graham roots, Don Graham, Donald Graham, Donald S. Graham, Donald Stimson Graham, Donald Stinson Graham, Napa Grahams, Washington Grahams, King County, WA., Naher family, Naher genealogy, Naher ancestors, Naher roots, Polley family of Massachusetts, Polley genealogy, Polley ancestors, Polley roots, Martin Polley, Martin R. Polley, Martin Richard Polley, Lowell Polley, Porter Polley, Porter P. Polley, P. P. Polley, Elnathan Polley, Massachusetts Polleys, Boston Polleys, Delaney family, Delaney genealogy, Delaney ancestors, Delaney ancestry, Delaney roots, James Delaney, Anna Delaney, Anna Louise Delaney, King County, WA, Skagit County, WA, King County genealogy, Skagit County genealogy, Cobourg, Ontario, Leix, Ireland, Napa County genealogy, Napa genealogy, Pat Delaney, Patrick Delaney, Patrick H. Delaney and John Muir, Yosemite, First Summer, mother, La Grange, California, Marysville, California, Yuba County genealogy, history of Marysville, California, history of Yuba County, Marysville, Yuba County, Sunrise Cemetery, Sunrise memorial cemetery, Vallejo, California, Giles Oviatt, Phebe Terrill, Phoebe Terrill, Phebe Tyrrill, Phoebe Terrell, Phebe Tyrrell, Abel Gillette, Abel Gillett, John Gillette, John Gillett, Comfort Plumb, Benjamin Plumb, Elisabeth Camp, Zebulon Gillette, Zebulon Gillett, Mary Bryan, Ebenezer Bryan, relatives, kin, allied, roots, forum, genforum, rootsweb, FHC, Family History Center, Salt Lake City, Mormon, LDS, gedcom, Mary and John, Mary & John, passenger list, Recovery, the Recovery, Windsor, Chaffcombe, Somerset, Jaques, Jaques de Gylet, France, 1688, Huguenot genealogy, Huguenot ancestors, descendants of, vital, statistics, records, 1722, history, Fidelio Buckingham, Gillette DNA, kin, kindred, kinship, family, reunions, families, relatives, family tree, Naher genealogy, Naher family tree, Naher ancestry, Naher surname, heraldry, colonial, Reunion, Gellitt, Jillett, Gillet, Gilett, Gylet, Jellet, Jillitt, Jillit, Jylett, Suffolk County, Connecticut genealogy, New York genealogy, Milford genealogy, Wethersfield genealogy, Gillette forum, Jonathan Gillett, Jonathan Gillette, Jonathan and Nathan, father, Huguenot ancestors, descendants of, King, Marion Township, Boone County genealogy, Indiana, Indiana genealogy, Henry county, Indiana, Henry County genealogy, Knightstown, Indiana, Davenport, Iowa is next door to Colona Illinois, Colona Illinois is next door to Davenport, Iowa, historical society, Milford births, Milford deaths, Milford lookups, Milford marriages, Milford Historical Society, Platt, Windsor, CT, Simsbury, CT, Gillettes of Milford, Gilletts of Milford, Nathan Gillett Pond, Nathan G. POND, Nathan Gillette Pond, Windsor, CT, Simsbury, CT, New Haven, colonial Connecticut ancestry, Jellett, descendants of, 1722, Buckingham ancestry, history of Milford, Milford genealogists, Milford roots, Milford ancestors, Milford ancestry, Milford history, history of Milford, genealogy in Milford, CT, history of New Haven, New Haven, CT, New Haven, Connecticut, New Haven births, New Haven deaths, family tree, New Haven lookups, New Haven marriages, New Haven Historical Society, New Haven lookups, New Haven genealogy, New Haven genealogists, New Haven roots, New Haven ancestors, New Haven ancestry, New Haven history, history of New Haven, genealogy in New Haven, CT, history of New Haven county, New Haven county, CT, New Haven county, Whitten genealogy, Whitten ancestors, Whitten family tree, Whitten roots, John Whitten, John Day Whitten, Whitten family, Rush County, Indiana, Centre Township, Rush County, Indiana, Preble, Ohio, Preebele, Ohio, Preble County, Preeble County, Connecticut, New Haven county births, New Haven county deaths, Monroe County, Illinois, Monroe County genealogy, family tree, New Haven county lookups, New Haven county marriages, New Haven county Historical Society, New Haven county lookups, New Haven county genealogy, New Haven county genealogists, New Haven county roots, New Haven county ancestors, New Haven county ancestry, New Haven county history, history of New Haven county, genealogy in New Haven county, CT, Family History Center, FHC, RootsWeb, Gillette genforum, Gillett genforum, Gillet genforum, library, census, USGenWeb, reunion, genforum, forum, message board, gedcom, Huguenot genealogy, Huguenot ancestors, descendants of, vital, statistics, records, Gillette genealogy, genealogical society, Tryon ancestors, Tryon family, South Carolina genealogy, Indiana genealogy, cyndislist.com, Cyndy's List, Cyndis List, Cindy's List, Brookhaven, NY, Brookhaven, Suffolk County, NY, colonial Connecticut ancestry, colonial Long Island, colonial New York, Jellett, history of Long Island, Long Island genealogists, Long Island roots, Long Island ancestors, Long Island ancestry, Long Island history, history of Long Island, genealogy in Suffolk County, history of Long Island, Hans Wischneski, Johann Wischnesky, Johann Otto Wischnesky, Hey Johann, get in touch, John Gillette, son of Donna Gillette of Maine, Donna Gillette of Maine is the mother of John Gillette, Hey John, get in touch, Hey Donna, get in touch, Marika Wischnesky, Hey Marika, get in touch, Debbie Ford, Deborah Ford, Deborah Ann Ford, Kandle Ford, Kandle Shomper, Debbie Shomper, Deborah Shomper, Paris Ford, Kandle Ford, Paris Shomper, Hey Paris, get in touch, Bonnie's brother in California is Robert, last name Gillette, Boni's brother in California is Robert, last name Gillette, Suffolk County births, Turner genealogy, Turner ancestors, Suffolk County deaths, Suffolk County lookups, Suffolk County marriages, Suffolk County Historical Society, Suffolk County genealogy, Suffolk County genealogists, Suffolk County roots, Suffolk County ancestors, Suffolk County ancestry, genealogy in Suffolk County, Avery genealogy, Avery family tree, Avery roots, Avery ancestry, Avery ancestors, Randall genealogy, Randall roots, Randall ancestry, Randall ancestors, Randall family tree, seeking Whitten in Alameda County births, February 1949, Alameda County genealogy, history of Alameda County, California, Orinda, Whitten in North Bend, Oregon, Whitten in Oklahoma, Whitten, Indian Agent in Oklahoma, Indian Agent, Indian Affairs, Wischnesky genealogy, Randy Wischnesky married Bonnie, Randy Wischnesky married Boni, Cunningham genealogy, Sam Cunningham, Samuel Cunningham, Sam Cunningham married Bonnie, Sam Cunningham married Boni, Nuniez genealogy, Peterson Nuniez, Pete Nuniez, Peter Nuniez, Martin genealogy, Wayne Martin, Moore genealogy, Darryl Moore, Darryl Rae Moore, Darryl Ray Moore, Darryl married Bonnie, Darryl Moore married Boni, Darryll Moore married Bonnie, Darryll Moore married Boni, Daryll Moore married Bonnie, Daryll Moore married Boni, Ford genealogy, Steve Ford, Steven Ford, Stephen Ford, Steve Ford married Bonnie, Steven Ford married Bonnie, Stephen Ford married Bonnie, Steve Ford married Boni, Steven Ford married Boni, Stephen Ford married Boni, Wischnesky ancestors, Wischnesky family tree, Wischnesky roots, Wischnesky ancestry, Cunningham ancestors, Nuniez ancestors, Martin ancestors, Ford ancestors, Moore ancestors, Hawaii, Portland, Maine.